This guide was put together by volunteers of the UN Volunteer Programme and from The Ideas Partnership NGO. We also asked other NGOs working on environmental issues in Kosovo for information and contacted the Prishtinë/Priština Green Drinks mailing list for additional ideas and inputs. Our focus was on gathering information about services which can help people to live sustainably in Kosovo and which supports environmentally and socially responsible choices. 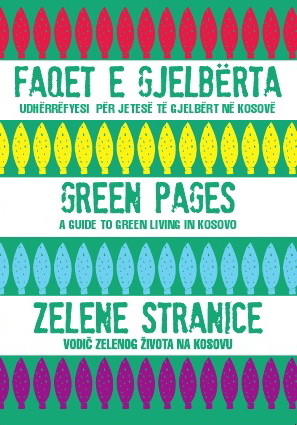 As the guide is Kosovo specific we haven’t included details on green living in general (e.g. turn the lights off when you leave the room, don’t let the water run while you’re brushing your teeth) which are readily available in other guides to green living. We hope this guide will help you to live in Kosovo in a way which protects and prolongs the fragile environment here. We would like the guide to be a lasting resource. With this in mind we hope it will be updated by people adding new information via this blog. We have made every effort to check the details here, but if you find an inaccuracy or something you think should be included in the guide which we’ve missed, please email theideaspartnership@gmail.com or post a comment on the blog. This entry was posted in english on September 11, 2012 by kosovogreenpages. Just wanted to write a quick thank you for the work you are doing in Kosovo. We first “heard” about you with the article that appeared in the Prishtina Insight on collecting bottle caps for wheelchairs. My Kosovo friend and I had just started a recycling company in Gjilan, Kosovo at that time and rather than sell the caps we started collecting them and turning them in at AUK through BLyn our friend in Prishtina for wheelchairs. I just read through the Green Pages and wanted to let you know about how we got started as it something we have thought about extending to other cities in Kosovo. We went around to the cafe bars and restaurants in Gjilan and offered to give them a recycling container and bags if they would start saving their plastic bottles, cans, etc instead of throwing them in the trash. We currently collect from them 3 days a week. We have also given containers to individuals for their homes, and have some in the local private universities. After we got started with that we opened up our own recycling plant and now purchase plastics from the local collectors. Many of the collectors come to us now as we treat them with dignity and respect, not only giving them a fair price and not cheat them on the weight but offer them a cold drink of water or soda and something to eat when we have it available. We also give them a logo’d tee shirt after they collect and deliver 500kg of plastics to us. Another thing we have in the works is a “coloring book” for educational purposes as we believe that if we educate the young people in Kosovo about the benefits of recycling now it will make for a better Kosovë in the future. We also teach our workers best business principles and practices as something they can use now and in the future. I have attached a copy of our brochure in english and albanian if you are interested in taking a look at it. Ron Ramsey (E: ramzoo@mac.com) runs a recycling company in Gjilan. See attachments in Albanian and English for further details. This entry was posted in english and tagged Gjilan, plastic bottles, Recycling, tin cans on September 20, 2012 by kosovogreenpages. The following NGOs would be happy to receive your support! This entry was posted in english and tagged Birdwatching, Gardening, Green Drinks, NGOs, Volunteering on September 19, 2012 by kosovogreenpages. Why not consider Kosovo for your next holiday? It would be kinder to the environment and to Kosovo’s economy. Treat yourself to a Kosovan ‘staycation’ and spend less time, money and fossil fuel on the journey and linger awhile in one of the country’s beauty spots taking big breaths of fresh air. The Mazrekaj Kulla in Drenoc, near Deçan/Decane.A kulla is a fortified stone house, typical to Kosovo and northern Albania. Once common in much of the country, most kullas were knocked down or fell down in the conflict and afterwards. This one is a rare survivor, restored by Cultural Heritage Without Borders with a modern bathroom and kitchen where you can prepare your own food (though you can also order traditional meals to be delivered by a local women’s co-operative). Downstairs, the former stable has been equipped with furniture and a PowerPoint screen for seminars. There are three double bedrooms plus the wonderful oda or men’s meeting room, with original wood carvings and cushions, complete with a cosy wood burning stove in winter, and shuttered windows to open for summer evenings. Beds cost 15 Euro per person per night for groups of up to 3, 10 Euro per person per night for groups of 4-7 people. The seminar room can be rented for 25 euro for half a day. The kulla is close enough to Deçan/Decane to be easily combined with a visit to the UNESCO World Heritage Site monastery nearby. Contact – P: 044 253 412. Reka e Allagës in the Rugova valley. The Rugova Valley offers a number of accommodation options, including individual chalets and homestays (approx. 15 Euro per night for homestay, rates vary for chalets). Reka e Allagës is an idyllic spot. 45 minutes drive from Pejë/Pec the village is set in the stunning mountains with views to the peaks forming the Montenegrin border and surrounded everywhere by the heady medicinal scent of marjoram. Families in the village use this and other herbs to make tea. Contact – P: 044 661 797. Hoçë e Madhe/Velika Hoca This small town in the heart of the wine-making region of Rahovec/ Orahovac has many beautiful monasteries and churches some as old as the twelfth century. Four old houses have been restored by Cultural Heritage Without Borders for homestay. Contact – the Spasic family on 044 624854 or the Kostic family on 029 277029. Germia park This is the green lung of Prishtinë/Priština. There are several walking and cycling routes. Check out the Bradt Guide to Kosovo for more detailed information. You can also rent bikes and horses there. This entry was posted in english and tagged eco tourism, Germia Park, hiking, homestay accommodation, kulla, Rugova valley, walking on September 19, 2012 by kosovogreenpages. Prishtinë/Priština has an ever growing traffic congestion problem, which adds to the already grim air quality in the city. There are plenty of alternatives to travelling by car or taxi. Trains Trains are Kosovo’s best-kept secret. The seats are like armchairs and you can make yourself comfortable and look out of the window as you admire the beautiful countryside. The train station in Prishtinë/Priština is west of the centre near the end of Garibaldi Street. The station serves trains to Pejë/Pec and Skopje via Fushe Kosovë/Kosovo Polje train station, Sheshi i Lirisë, 7 km west of the city centre. Find up to date information about timetable and prices for all rail travel starting in Kosovo online. Click for the English version and then on ‘passenger transport’ and ‘train schedule’. Contact – W: http://www.kosovorailway.com/ E: info@kosovorailway.com. P: 038 536 619 / 038 550 550 242 / 038 550 550 500. There is a second hand bike lot at M2/E-65 between Llugaxhi and Babush, where bikes can be bought for 50 Euro. Anadolli bicycle shop in Pejë/Pec, Mbreteresha Teuta Street no.122, sells and rents bikes. Don’t forget about carpooling Fewer cars on the road means less exhaust fumes and less terrible traffic congestion in Prishtinë/Priština! This entry was posted in english and tagged Bikes, Bus, carpooling, Cycling, Train, Transport on September 19, 2012 by kosovogreenpages. There are several good reasons to buy locally in Kosovo. Fewer imports mean less transport pollution, lower carbon footprints and more self sufficiency and investment in the local economy. And did we mention how tasty the local produce is? Drink local water…There is a large range of locally sourced mineral water available in Kosovo and it is easy to ask for…cards are available from The Ideas Partnership which say “I want to drink Kosovan water: Dea, Bonita, Kllokot, Rugova, Akull…are fine for me and for the Kosovan economy.” Filikaqa sports bar and the Amelie chain of cafes offer Kosovan water if you ask for it. Eat and drink the excellent local produce…such as Stone Castle and Eko wine, locally made Raki, Vita milk, Frutomania 100% juice and Dona juice or why not try Ajvar, a smoky relish made from locally grown red peppers. Kosovan honey is excellent and most is mixed with wildflower honey from bees that have foraged on a range of flowers. There is also a dark, nutty chestnut (‘geshtenje’) honey which goes particularly well on porridge and a fine acacia (‘bagrem’) honey. It’s also possible to find delicious lavender honey from some beekeepers. Check out the markets in Ulpiana or behind the Great Mosque in Prishtinë/Priština for fresh produce. The main green market and the wholesale vegetable and food market is on the road to Fushë Kosovë/Kosovo Polje behind UNMIK. Vullneti i Grave or ‘Women’s will’ is a group of women skilled in handicrafts from the Roma, Ashkali and Egyptian community in Roma Mahalla, Mitrovicë/a. The idea behind our products is to combine traditional handicraft techniques used in Kosovo, such as crocheting, with innovative and environmentally-friendly materials. Looking at the amount of waste, especially plastic bags, that litter the streets and parks in Mitrovicë/a, the women felt that by ‘recycling’ these bags they could make their own small contribution to a cleaner city and inspire other people to think about the environment. Peki Pek Peki Pek makes beautiful handmade jewellery. Check out details about her shop on her Facebook page Peki Pune Dore. Delvina antiques In Prishtinë/Priština and Prizren, there are branches of the small Delvina antiques/ handcraft store offering unique gifts and souvenirs. There are also some good shops in Prishtinë/Priština on UCK Street, some by the pharmacies near the District Court, and Krenare Rakovica (Contact – P: 044 833 118 E: krenare.rakovica@gmail.com) who makes her own filigree jewellery and has a shop opposite the Grand Hotel on Garibaldi Street. Emina is a Bosnian women’s group in Mitrovicë/a which makes a range of traditional handcrafts. Contact – P: 049 838 423 E: emina011@hotmail.com. Another handcrafts group from Mitrovicë/a is the miners’ wives NGO. Contact – P: 044 565 768/ 049 673 816. Traditional rugs can be bought by the side of the road (on the left as you approach from Prishtinë/Priština) just before the entrance to Pejë/Pec. The person that carries stuff does not regret and who has a good bag is happy but who gives to someone as a gift a bag from I’m LU makes that person to feel special and pleased. Come on, choose and search for the special and the best one! This entry was posted in english and tagged ajvar, Buy local, cosmetics, filigree, fruit juice, handcrafts, honey, jewellery, local produce, local water, markets, organic products, wine on September 19, 2012 by kosovogreenpages. Another way of being kind to the environment and the local economy at the same time is to source your office supplies locally. This chain sells general office supplies, including recycled paper. If you can’t find what you are looking for they are usually very helpful in trying to find it for you. Contact – P: 038 245 263 or 038 725168. The Hashani family make a variety of furniture to order. They don’t have a showroom, you simply have to go to their workshop and tell them what you want, and they will suggest the type of wood to use, as well as what will work and what won’t work in the nicest possible way. Somebody is usually there who speaks English. Contact – P: 044 247 579 or 049 247 579. Mobileria Blini Dardani, Ferizaj/Uroševac, 10 km from Ferizaj/Uroševac on the way to Gjilan/Gnjilane, 2km after Camp Bond-Steel. This shop has a showroom and makes a large amount of furniture to order. Favourites include the beautiful garden furniture. Contact – P: 044 281 321 E: mobileria_blini@hotmail.com. If you need someone to translate from English, call the son, Irfan, on 044 324 539. This entry was posted in english and tagged furniture, Office supplies, printer cartridges, recycled ink, recycled paper on September 19, 2012 by kosovogreenpages. Kosovo has an inadequate waste management system, which means that plastic bags which enter the ecosystem are likely to end up snagged on trees, blooming in the fields or choking the waterways. Did you know that plastic takes 400 years to biodegrade? So…want to be plastic-bag free? Try reusable cloth bags or paper bags instead. The Dit e Natë (Fazli Grajcevci Street no.5; E: info@ditenat.com; FB: Dit’ e Nat’) bookshop and Dukagjini bookshop (Nenë Terezë Street no. 20; P: 038 248 143/244 031) both offer their customers strong paper bags. This entry was posted in english and tagged cloth bags, packaging, paper bags, plastic bags on September 17, 2012 by kosovogreenpages.